Peace and love. Peace and love. This is the second time Computron has chosen a Ringo Starr record, and neither of them are one of his good records. I don’t know if I ever listened to this record. It was given to me by Cari and Adam when they received it for Being There. I do know that when I went to find it on my computer, it wasn’t there. Also, I should say that I own a few Ringo records… some of which I actually enjoy, but unlike how the current trend might imply, Ringo does not occupy 9% of my record collection. Listening to this record, it’s hard to believe that this is an album made by a former-Beatle. This album is almost a parody of the Ringo-sound, and I don’t think anyone would be surprised to hear that it’s not a great record. Ringo has made good records. His album Ringo and Goodnight Vienna are perfect examples, as those records are filled with some of the best songwriters or his era; Harry Nilsson, John Lennon, Paul McCartney, Elton John, George Harrison, Randy Newman, Allen Toussaint and more. 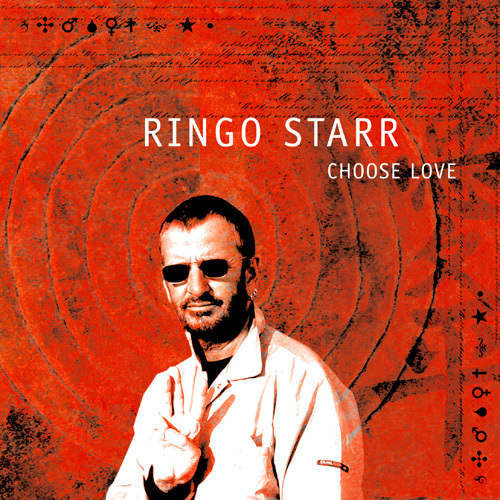 Choose Love features the songwriting of Ringo Starr, Mark Hudson, and Gary Burr. Those two must be living a dream, working with a Beatle, but for a Beatle to work with those two, is disappointing to say the least. Finally, can we talk about the cover? Who shot this? It’s a terrible photo. It looks like Ringo has six fingers. It looks like his thumb and pinky are touching (as they are, and then his remaining four fingers are doing the Vulcan salute. “Give Me Back The Beat” is HORRIBLE. Oh my lord, Ringo! What were you thinking when you wrote “Don’t Hang Up?” Did you not learn anything from hanging out with John Lennon, Paul McCartney, and George Harrison?